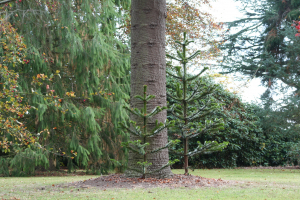 Observation - Monkey Puzzle - UK and Ireland. Description: Bole, generally straight and cylyndrical. The leaf is very hard and leathery, abright shiny dark green, almost plate like. Bole, generally straight and cylyndrical. The leaf is very hard and leathery, abright shiny dark green, almost plate like.